The glitz and glamor that signified the 1920s are raging back into style at the third-floor lounge inside St. Charles’ classic former moviehouse. Step inside and see why it’s become such a hit for evening entertainment. 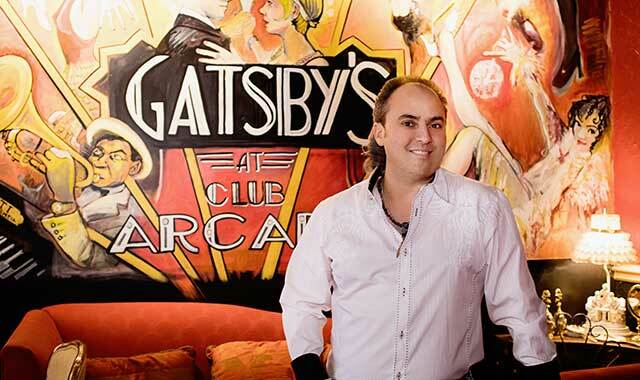 Ron Onesti, owner of Arcada Theatre and its Club Arcada, is bringing back the theater’s classic Roaring Twenties feel with a new speakeasy club. Arcada Theatre opened to wide acclaim in 1926 in downtown St. Charles. The venue at 105 E. Main St. was the place to go in the Fox Valley for vaudeville headliners such as Judy Garland, George Burns and Gracie Allen, and ventriloquist Edgar Bergen, with his puppet sidekick, Charlie McCarthy. Those vaudeville days are long gone, but Arcada is once more the region’s place to meet the stars. Nowadays, contemporary talent such as Petula Clark, Wayne Newton, Pat Benatar, Cheap Trick, America and Dennis Miller provide the entertainment. Already known for its impressive lineup of stars, Arcada is also crafting a new niche: the speakeasy club. Guests pass through a “secret” door in the library to enter the intimate third-floor restaurant and bar at Club Arcada, which seats about 150 diners. Turn left and access the Prohibition Lounge, where one can check out Louis Armstrong’s Speakeasy Bar, a copper and bronze space flanked by a 48-star flag from the 1933 World’s Fair in Chicago, an antique cash register and 100-year-old beer taps. Browse further and discover Charlie Chaplin’s “Little Tramp” room and examine 1908 vintage camera equipment and Chaplin posters. Next, stop by the Fred and Ginger Ballroom, the main showroom of Club Arcada, with its professional dance floor, muraled walls and intimate stage, where performers entertain a few nights a week. There was once a time when Arcada Theatre sat neglected, and talk turned toward demolishing the historical building to create a parking lot. Its future was uncertain until a white knight arrived. “I saved it from the wrecking ball,” says Ron Onesti, who acquired the facility 11 years ago and has overseen its step-by-step rejuvenation. Onesti says the ongoing restoration – including new lighting and sound systems and refurbished dressing rooms – has proven expensive and time-consuming, but he’s determined to retain the original Roaring Twenties look and feel of the venue. So far, reopening the third-floor speakeasy-themed restaurant has proven a hit. Staff members in vintage costumes serve Prohibition-era beverages and put on Flapper Girls’ floor shows. Dinner is served in all six rooms at Club Arcada. Many customers arrive early for a pre-show dinner and also to allow time to browse the lavishly decorated rooms. After dinner and a show, it’s not unusual for guests to stop by for a nightcap or dessert, says Onesti. The menu showcases flatbreads, an East Coast shrimp cocktail and Onesti’s own Italian-seasoned Caprese salad. “Two popular dishes are the maple-glazed salmon and the tender and juicy 6-ounce filet,” Onesti adds. Another in-demand dish is the charcuterie board, laden with imported meats and cheese from Italy. Diners give high marks to the restaurant’s homemade meatball flights (barbeque, slow roasted and pulled pork) served on a pretzel roll. The menu is influenced by recipes handed down from Onesti’s mother. Twice a year Onesti and chef Inocencio Sanchez review the menu. More than 80 bourbons (mainly from Kentucky) are stocked at the bar. Sixty percent of the well-rounded wine list is imported from Italy, France and Argentina. There’s also an appealing mix of craft beer, several on draft. The variety represents what people are seeking: IPAs, stouts, ales and light beer. Onesti says he tries to have some hard-to-get varieties on hand. Reservations are recommended and are accepted over the phone or via the Open Table app. Diners are encouraged to “dress to impress,” so tank tops, flip flops, shorts and tattered jeans are not allowed, though nice jeans are accepted. Club Arcada is open for dinner Wednesday through Saturday from 5-9 p.m. and Sunday 4-8 p.m., with the bar staying open later. This entry was posted on Tuesday, January 9th, 2018 at 12:00 pm	and is filed under Dining Guide, Top Posts. You can follow any responses to this entry through the RSS 2.0 feed. Both comments and pings are currently closed.